Away from the crowded backwaters of Alleppey is the OYO Travancore Palace, a heritage property that is a legit palace! It’s perfect for a weekend getaways in God’s Own Country. A vacation in Alleppey naturally means living in houseboats and exploring the backwaters of Kerala. But away from the hustle and bustle, and the touristy spots of Alleppey is a property that will take you back to the times of the kings and queens of Kerala. 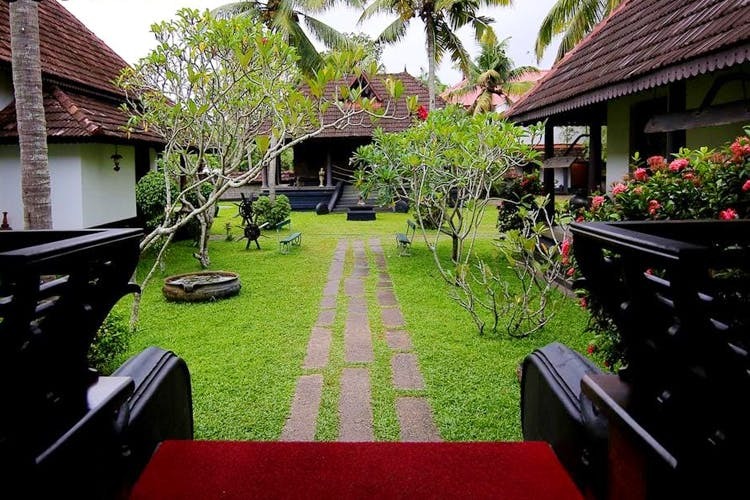 Built in the traditional naalukettu-style of Kerala architecture the OYO Travancore Palace offers you a slice of heritage stay without missing out on all the modern amenities including air conditioners to battle the sultry summers of Kerala. Palaquins, horse-drawn carts, and the famous snake boats of Kerala feature extensively as decor elements while the red-oxide floors, wooden rafters and pillars, give it that heritage feel. We can’t get enough of the local architectural features such as tiled roofs, chuttu verandah, and the nadumuttom, which is the central open courtyard around the restaurant area. Rooms are updated of course, so expect air conditioning, flat screen televisions and power showers. You will even be treated to a view of the gorgeous small temple in the middle of the garden. St. Andrew’s Basilica Arthunkal, Vembanad Lake, and Kumarakom Bird Sanctuary are all within the 10 kilometres radius from the property, and the hotel will arrange transport if you ask. But we suggest you soak in all of that heritage vibes of the property before you venture out. The whole place is dotted with antiquities and paintings that give off a very museum-like vibe, but unlike a museum, you can touch these. And photograph them too! Head to Akathalam, the in-house restaurant, for Kerala fare made fresh using local ingredients. You will be surprised that the menu goes beyond idlis and dosa and will have you eating puttu, ada, and nool appams. No, we are not telling you what these are, go there, try it and tell us how you liked it. Or you could ask your Malayali friend. Afternoon siestas can be on the lawn or near the charupady (a verandah) where one can sit and catch up. Come evenings, the bar lounge is open for service and you don’t need us telling you what needs to be done there. The per night charges for two people is INR 4,498 and is inclusive of complimentary breakfast. You can book your rooms here. They are currently running a discount where you get 50 per cent off on the room rate.